Skeleton (in lateral view) and skull (in palatal view) of the Santacrucian interatheriine Interatherium robustum (modified from Sinclair 1909). The skeleton of this species is longer and lower than that of most interatheriids. The Interatheriidae (interatheres) are perhaps the most successful group of notoungulates; they are the longest-ranging of all notoungulate families, and nearly two dozen genera have been described (though it is unclear how many of these are valid). Moreover, interatheriids are often very abundant in the faunas in which they are found, suggesting high population densities; they are one of the most common mammals in the early Miocene Santa Cruz Fauna of southern Argentina (Croft 2013) and are similarly common in the middle Miocene La Venta Fauna of Columbia (Stirton 1953). They have been collected in nearly every well-sampled fauna of appropriate age from northern Venezuela to Patagonia. Interestingly, some Miocene faunas from northern Chile and Bolivia are exceptions to this pattern; interatheriids have not yet been found at Chucal, northern Chile, and they are quite rare at Quebrada Honda, Bolivia (Croft et al. 2009). Left: Skull of Protypotherium australe in right lateral view, approximately 8.5 cm long (modified from Sinclair 1909). The jugal bone is highlighted in red. Note the presence of a closed (complete) dentition that has no significant spaces among the teeth. Right: Feet of two interatheres (center and right) compared to that of a modern peccary (Tayassu, right). Modified from Stirton (1953). Interatheriids were mostly small to medium-sized animals, in life probably weighing between 500 g and 15 kg (the size of an Eastern gray squirrel to that of a red fox or raccoon). 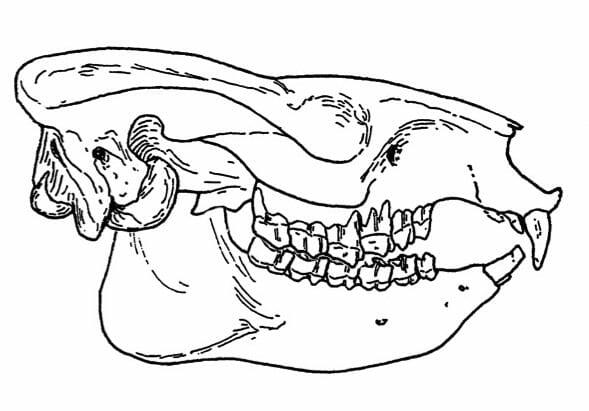 They share the presence of a unique feature of the skull: the jugal (one of the bones comprising the zygomatic arch) is separated from the orbit by the maxilla (the upper jaw bone; see above). Interatheriids also have lower teeth with strong labial and lingual sulci, giving them a bilobed appearance. All interatheriids retain a full complement of teeth (three incisors, one canine, four premolars and three molars in each quadrant), though some of these teeth are reduced to very small pegs. The upper incisors are enlarged and implanted perpendicularly into the maxilla (like most mammals). This contrasts with the condition in some other typotheres (e.g., mesotheriids, archaeohyracids, hegetotheriids) in which they are implanted obliquely. The lower incisors are procumbent and form a comb-like structure that might have been used for grooming. The family Interatheriidae is generally divided into two sub-families, Notopithecinae and Interatheriinae, but it is unclear whether the former is a natural (monophyletic) group (Hitz et al. 2006; Vera 2013). The subfamily Notopithecinae includes the oldest members of the family, which are characteristic of faunas of Riochican through Tinguirirican age. Most notopithecines are are small and have low-crowned cheek teeth that display the “face” pattern of fossettes typical of typothere notoungulates (see below). Upper dentitions of Miocochilius (left, preserving P2-M2) and Notopithecus (right, including P1-M3). Both are shown as right dentitions (the Notopithecus specimen has been reversed) and anterior is to the right. Note the simplified teeth of Miocochilius compared to Notopithecus. Photos by D. Croft. Reuse permitted under CC BY-NC-SA 2.0. The subfamily Interatheriinae includes the geologically younger members of the family; they occur in Tinguirirican through Huayquerian faunas (though they are poorly known after the middle Miocene). Many interatheriines have simplified cheek teeth wherein all internal fossettes are lost and only the outlines of teeth vary among species. The simplification primarily results from the evolution of hypselodonty (ever-growing cheek teeth) in this group. Due to developmental constraints, it is not possible to maintain isolated fossettes while keeping the roots of the teeth open. Interatheriines are one of four groups of notoungulates that evolved this adaptation. In many respects, the teeth of interatheriines resemble those of hegetotheriids. They can be distinguished from hegetotheriids by the absence of a flat lingual face on the lower molars (the lingual face has a sulcus in interatheriines) and the presence of a pronounced lingual sulcus on the upper molars (most hegetotheriids do not display this sulcus, although there are some exceptions; see Reguero et al. 2007.) Unlike later hegetotheriids and mesotheriids, many interatheriines retain the primitive trait of a closed dentition (i.e., 44 teeth are present in the adult; none have been lost to create a space in the toothrow). One interesting aspect of the interathere skeleton is that some of the later forms reduced the lateral digits of their feet, creating a paraxonic (“two-toed”) foot similar to that seen in modern artiodactyls (Stirton 1953). In fact, as seen in the image above, the hind foot of the interathere Miocochilius is more similar in overall form to that of a modern peccary than a nearly contemporary interathere (Protypotherium). Croft, D. A. 2013. What constitutes a fossil mammal community in the early Miocene Santa Cruz Formation? Journal of Vertebrate Paleontology 33:401-409. Croft, D. A., F. Anaya, D. Auerbach, C. Garzione, and B. J. MacFadden. 2009. New data on Miocene Neotropical provinciality from Cerdas, Bolivia. Journal of Mammalian Evolution 16:175-198. Hitz, R.B., J.J. Flynn, and A.R. Wyss. 2006. New basal Interatheriidae (Typotheria, Notoungulata, Mammalia) from the Paleogene of central Chile. American Museum Novitates 3520:1-32. Reguero, M. A., M. T. Dozo, and E. Cerdeño. 2007. A poorly known rodentlike mammal (Pachyrukhinae, Hegetotheriidae, Notoungulata) from the Deseadan (late Oligocene) of Argentina. Paleoecology, biogeography, and radiation of the rodentlike ungulates in South America. Journal of Paleontology 81:1301-1307. Sinclair, W. J. 1909. Mammalia of the Santa Cruz Beds. Volume VI, Paleontology. Part I, Typotheria; pp. 1-110 in W. B. Scott (ed. ), Reports of the Princeton University Expeditions to Patagonia, 1896-1899. Princeton University, E. Schweizerbart’sche Verlagshandlung (E. Nägele), Stuttgart. Stirton, R.A. 1953. A new genus of interatheres from the Miocene of Colombia. University of California Publications in Geological Sciences 29:265-348. Vera, B. 2012. Postcranial morphology of Notopithecus Ameghino, 1897 (Notoungulata, Interatheriidae) from the middle Eocene of Patagonia, Argentina. Journal of Vertebrate Paleontology 32:1135-1148.